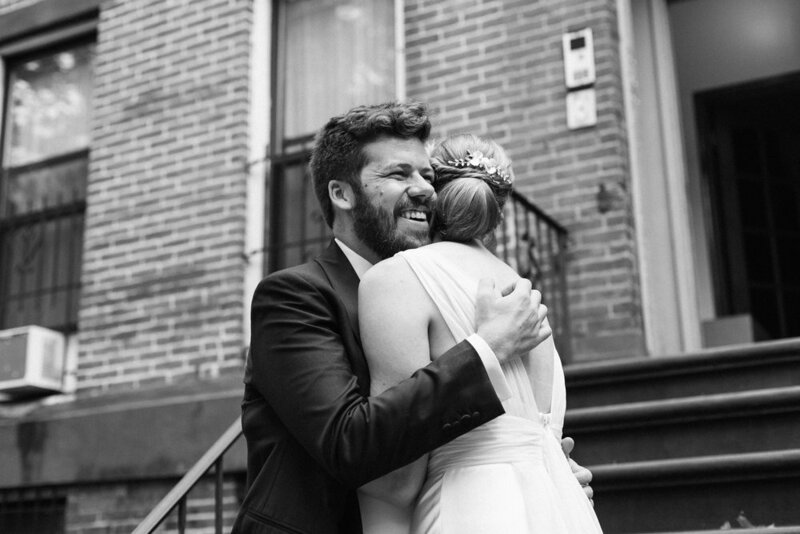 Aaron, a City Planner from Colorado, and Sarah, a Nurse Practitioner from Utah, met while living in Boston in 2010. We began dating after building a solid foundation as friends first, and decided to marry to reaffirm our commitment to creating a home and a life together. Sarah: How can I possibly choose a favorite part of the day? Some stand out moments are greeting the guests as they arrived and seeing our friends and family gather for the occasion, the ceremony itself which we’d written together with our officiant, harnessing the adrenaline and excitement from the ceremony to ride off on decorated Citibikes, and keeping the guest list small enough that I was able to have meaningful moments with each one throughout the night. My favorite part of the process was seeing everything we imagined in our head come to life! Aaron: My favorite part of the wedding day was getting married! Ok, seriously, my favorite part of planning was finding the venue, because that was when our vision for the day began to snap into place. Once we knew that we were able to envision where we were going to be standing and knowing that we had the chance to show off our neighborhood in Brooklyn and what our lives were like at that exact moment in time, our focus became about welcoming our friends and family--who are all spread across the country--to share in our lives at that moment. And once we had that focus, taking the time with Alexis over beers, or our wedding coordinator over wine, to reflect on what those moments and details are that reflect this moment in our lives, and building a vision for the day out from that, was a rich and meaningful way for us to think about what’s important in our new marriage. S: My top priority was that our wedding had a strong sense of self, time, and place. It was important that our event be a celebration of the life we’d built together in NYC, so we wanted to showcase our neighborhood and share the things we love about New York! I also wanted the planning process to be as stress-free as possible, keeping the event small, within our budget, and being intentional to only include traditions that were important and meaningful to us. A: Everything Sarah said. Also, the photography itself was a huge priority for us! It’s important to focus on your community and be present day of, but we also knew that this was one of those days that we’ll return to over and over, and want to share with our families in the future, so having an authentic and truthful document of how we felt and who we were at this point in time was really important to both of us. S: I am still surprised at how beautiful and smoothly the day went. I think it is entirely because of the amazing vendors we chose for the event-- Alexis and our venue coordinator really helped guide us throughout the entire planning process. I was also surprised by how noticeably different I felt afterwards. 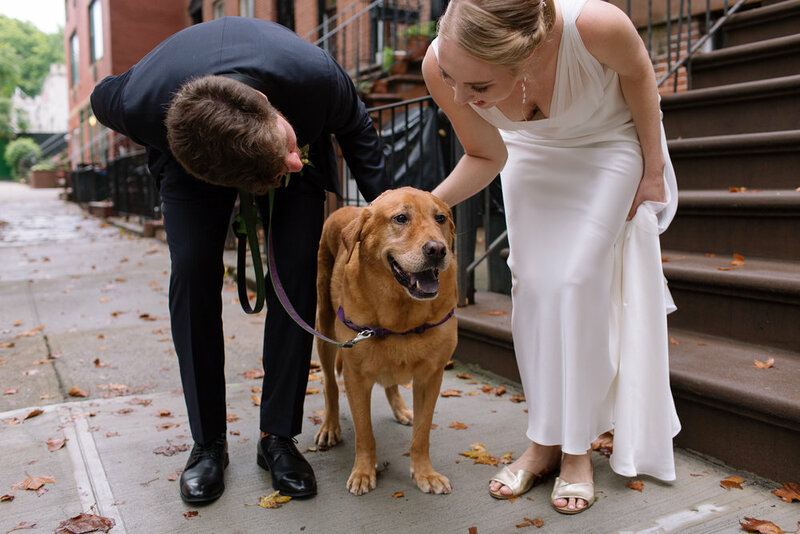 I was expecting the day to be a fun celebration with friends and family, but it truly was the best day of my life so far, and during the event Aaron and my relationship shifted, evolved, and deepened in profound and surprising ways. A: I second Sarah--it was a lot easier than I had thought it was going to be! I think we just had the right people supporting us, and we knew we didn’t want to fuss over a million little fire drills day of, so we mapped out a relatively simple day and then everyone came through! S: The event should represent the couple, so use that as a guide to prioritize the things that are important and build the wedding that showcases your life. A: Easier said than done, but plan for the right-sized wedding. 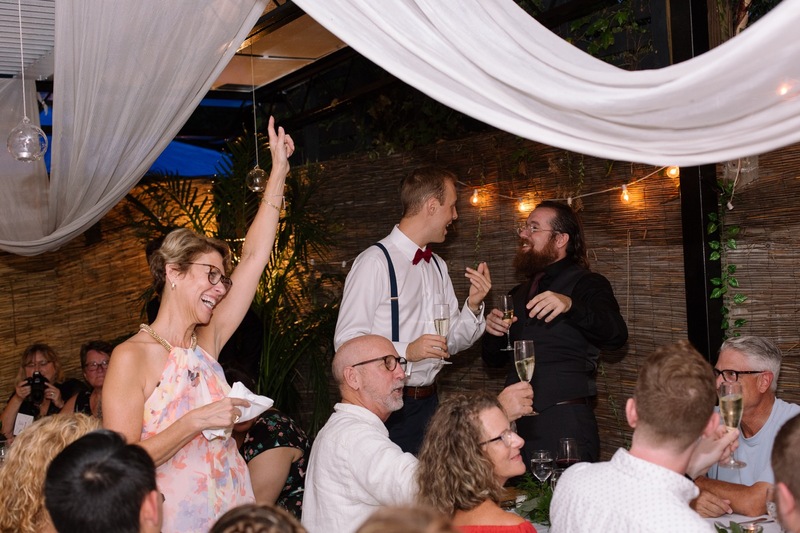 While getting the guest list down to a smaller number was difficult, having a manageable number of people join us meant we were able to spend time with each of our guests, and we had an intimate ceremony and reception. It also meant that we weren’t swamped with trying to get to everyone, so we had time to eat our food! The other principle in our planning that made a big difference was asking ourselves what was essential, and what was non-essential. 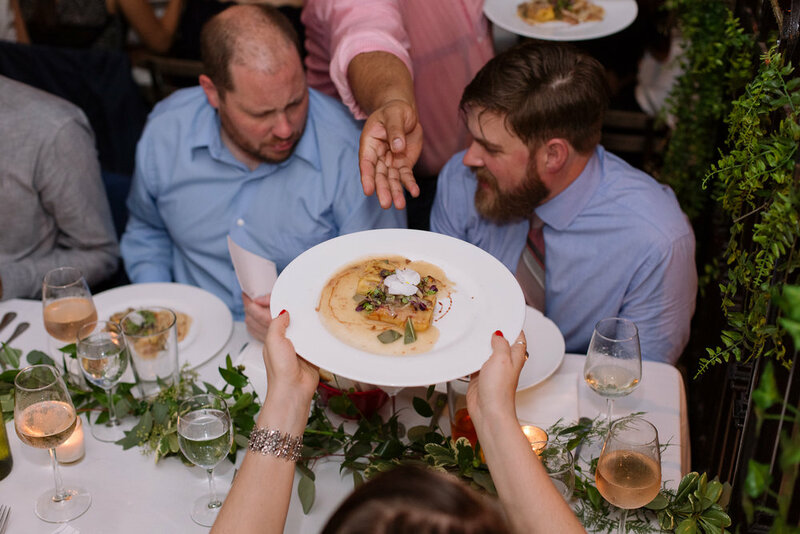 Casting overboard some of the common wedding standards and tropes allowed us to focus on what we really valued: great food, a gorgeous venue, an intimate ceremony, and 70 of the best people on earth! S: I’ll never forget the way Aaron looked at me all day and night, he is so expressive and you can read so much from his face. I’ve never felt so incredibly happy and loved and supported as I did that day, and know he was feeling the same. A: I’ll always remember the hundred little ways our friends and family came together to add all the little flourishes and moments that made it our perfect day. That Sarah’s brother Ricky came with us on the portrait shoot to carry the umbrella and get Hank home. Walking 30 minutes to our apartment with my brother and little nephew because we couldn’t take the baby in an Uber, so that we could have my family there while getting ready. Sarah’s brother and soon-to-be sister-in-law, Travis & Hannah, decorating CitiBikes for our getaway ride after the ceremony. Our friend Natalie doing so much work to craft a perfect ceremony as our officiant, but also her husband Dan bringing a camera for video, and acting as a wingman whenever we asked. Everyone felt very present for us, and that was so humbling to feel backed up in that way. S: We wanted to optimize the time we had with guests throughout the weekend, but also for them to feel inspired to explore the city on their own (New York is at its best when it’s discovered). To solve this, we created a “couples geo-cache” on GoogleMaps that would allow people to come find us around their schedule at some of our favorite places. It was such a blast! A: I can’t believe it rained on our outdoor wedding. But I will say that while that caused me a little stress and grieving that we weren’t going to be able to do some of the things we planned, Alexis posing a rain plan and back-up shoot in case we didn’t get the portraits we had hoped for just took the stress off my shoulders, and allowed us to relax and have an even better portrait shoot than I could have imagined. That perceptiveness and quickness to problem-solve meant a lot, and sealed the deal on a perfect day documented in perfect photos!